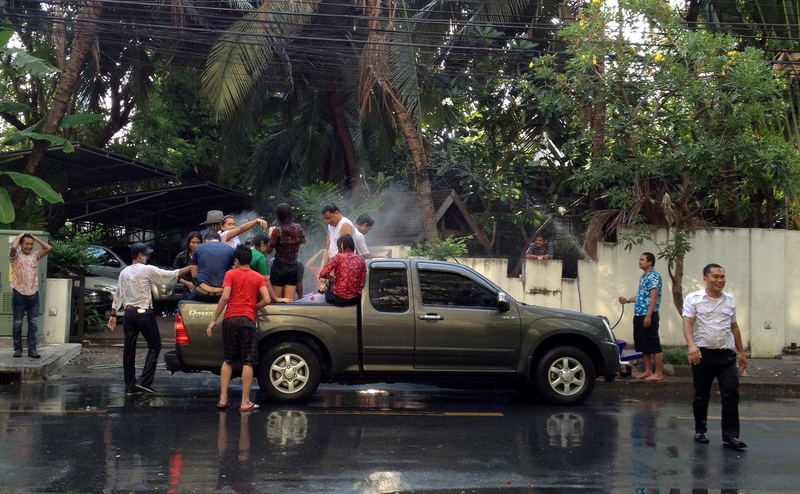 This entry was posted in Expat Life, Thailand and tagged Songkhran, Thai New Year, Water Festival by christao408. Bookmark the permalink. I’ve never been. Is it similar to Songkhran in Thailand? Thank you! If I recall correctly the “Dai” (or “Tai”) people are actually the ethnic group that eventually populated large areas of Northern and Central Thailand. I guess that, wherever you are in the world, a party’s a party—for better or worse! Although there is a good chance of someone getting injured, and hopefully everyone understands why they are getting drenched, I think this is a nice way of passing on blessings. You certainly do have a lot to watch from your condominium complex. Have a blessed and joy filled Easter week end. Yes, my condo and the surrounding area is a bit of a microcosm of Thailand. If I’m carrying a camera, will they still drench me? I just want to take pictures up close but I don’t want my camera to get wet. Too bad about the alcohol becoming part of the scene. It can be a deadly mix. Oh yes they will. Important to have your gear in plastic bags.